If you can not read the media, , download Flash Player. The Palace of Fontainebleau, located about sixty kilometres south-east of Paris, has witnessed eight unbroken centuries of sovereign rule. Kings and queens, and emperors and empresses, took great pains to embellish the palace, built around the original mediaeval dungeon. The palace and its park have been listed as Unesco world heritage sites since 1981. Used by the kings of France from the 12th century, the medieval royal hunting lodge of Fontainebleau, standing at the heart of a vast forest in the Île-de-France, was transformed, enlarged and embellished in the 16th Century by François I, who wanted to make it a 'New Rome'. "Surrounded by an immense park, the Italianate palace combines Renaissance and French artistic traditions", according to the Unesco website. This was the birthplace of the Fontainebleau School, a movement that was to dominate French artistic expression until the mid-18th Century. François I was fascinated by the Italian Renaissance and commissioned Italian artists for the construction and decoration of the palace. He ordered the construction of the Great Gallery (François I Gallery), the first gallery of its size built in France. Its décor of paintings, wainscotting, frescos and stuccos, realised by the Italian artist Rosso Fiorentino and depicting stories from Greco-Roman mythology and allegories, is the most famous in the French Renaissance. The building owes its most recent significant extensions to Henri IV. These extensions included the Belle Cheminée wing and the Gallery of Stags, and bore host to magnificent decorations, designed by a new generation of French artists who formed the Second Fontainebleau School. The emblem of the palace remains the renowned horseshoe staircase by Jean Androuet du Cerceau. This work, commissioned by Louis XIII, connects the various sections of the palace. During the 18th Century, the reigns of Louis XV and Louis XVI were to see a great number of redecorations and new styles. Napoleon I in turn oversaw extensive restoration work and refurnished the palace after it had been emptied by the Revolution. Under the Second Empire, Fontainebleau became one of the favourite residences of Napoleon III and his wife, Eugénie, who carried out the final major architectural modifications. The palace offers the very latest in comfort. Inspired by the Opéra Royal at Versailles, Hector Lefuel's imperial theatre played host to the Court's inner circle for private performances. 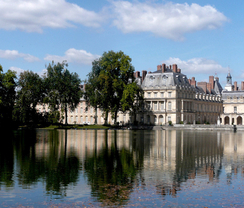 Today, visiting Fontainebleau is like travelling through time and style, reflected by the grandiose surroundings but also by the private lives of great figures - the many richly-furnished apartments open for visit are the Sovereign's great apartments, the two boudoirs of Marie-Antoinette, the Pope's apartment, the Hunting Lodge, the apartment of Madame de Maintenon and typical private apartments from the Napoleon III era, fitted out in a 'grand Hôtel' style, where the Emperor's guests could enjoy all the comfort the era afforded. Alongside its rich architectural setting, the building houses an exceptional collection of paintings, sculptures and objets d'art, from the 16th to the 19th Century, and numerous centrepieces, such as the throne of Napoleon I. The Royal Elephant, a Fiorentino fresco on show in the François I Gallery. The Ballroom. Built during the reign of Henri II, it is connected to the building by the François I Gallery and houses several works from the Italian Renaissance. The gardens. The park of the palace, which spans 115 hectares, is dotted with fountains and includes an orange grove and French- and English-style gardens. The five courtyards. The Cour du Cheval Blanc (or Courtyard of Honour), the most famous, owes its name to the equestrian statue by Marc Aurèle and the famous Horseshoe Staircase. This courtyard was also the scene of the Emperor's Farewell to his guard on 20 April 1814. See also the Cour ovale, Cour de la Fontaine and Cour des Offices. 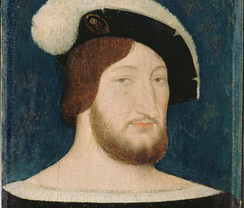 In 1515, Francis 1st, head of the Valois-Angoulême branch, succeeded his cousin ... Louis XII, whose daughter, Claude de France, he had married, for a thirty-two year reign. It started with the wars with Italy, the victory of Marignano and the transfer of the Quattrocento to France. First Consul and subsequently Emperor of the French, Napoleon Bonaparte was a ... leading figure in Western history. He left behind a number of long-lasting institutions: the Napoleonic Code, the State Council, the prefectural system, the judicial system, financial administration, the centralised University of France and military academies. 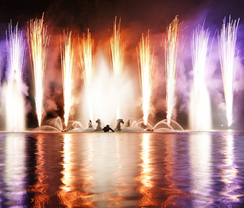 Discover the gardens of the Château de Versailles as you have never seen them ... before during the Musical Fountain Display and the Nocturnal Fountain Display. How's the weather in France?